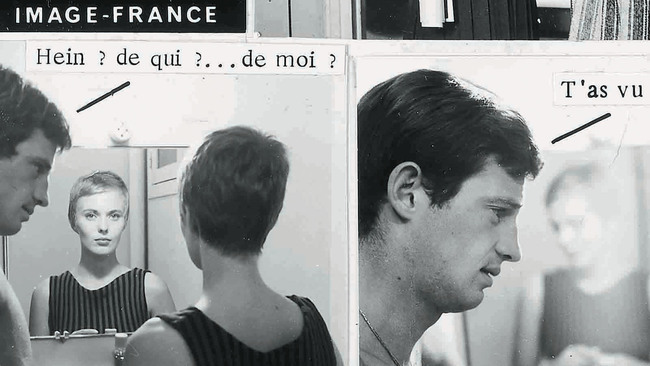 From Éditions Matière comes Contrebandes Godard 1960-1968, a collection of promotional materials inspired by comics and the Situationists for the films Godard made during those years, unpublished since but now gathered and commented on by Pierre Pinchon, who teaches at Aix-Marseilles University. Even those who, like me, don’t read French will want to see the page for the book, as well as the examples Pinchon writes about for Trois Couleurs. In the run-up to the opening of Chris Marker: Les 7 vies d’un cinéaste, an exhibition opening at the Cinémathèque française on May 3 and moving on to BOZAR in Brussels in September, Sabzian has gathered news of several relevant volumes already out now or on their way. Bogart was the lone American; you also had Bergman (Sweden), Claude Rains and Sydney Greenstreet (England), Paul Henreid (Austria), Conrad Veidt (Germany) and Peter Lorre, originally from Slovakia by way of London, who said that, like Brecht, he had changed countries “oftener than our shoes.” Hungarian S. Z. Sakall, who played the head waiter, lost three sisters to the concentration camps. Despite becoming known later in her life as a defender of popular taste in movies, a defender of visceral reactions, she had larger questions about them: about the quality of the ideas they represented, about the way they fitted into the larger puzzle of both cultural and intellectual life in America. Another was the exuberant energy that would eventually become the Kael trademark. Her personality emerges mostly in the vigor with which she analyzes something, turning it over, looking for clues. Another was that, interested in the mass audience as she was, she would never be afraid of kicking a popular phenomenon in the teeth. Kael’s role as a critic, she believed, was to run roughshod over the politics of reputation. This did not make her popular. James Layton and David Pierce, authors of King of Jazz: Paul Whiteman's Technicolor Revue, are Michael Gebert’s guests on NitrateVille (57’53”). At Fonts in Use, Quentin Schmerber presents a typographical history of Katsuhiro Otomo’s landmark manga series, Akira. For One Grand Books, Rose McGowan has written up a list of her ten favorite books.